To fit: 6 mos (12 mos, 2T). 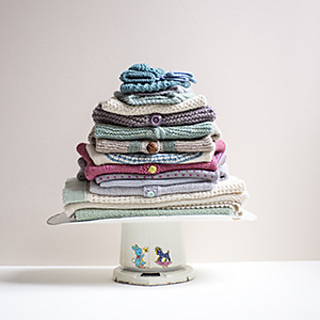 Harold is available in the Kelbourne Woolens Baby Collection and also as an individual PDF download. Harold is worked with an integrated icord around all edges, and is finished at the shoulders with a 3-needle icord bind off. The body is knit in one piece, beginning at the back and increasing both fronts as you work. 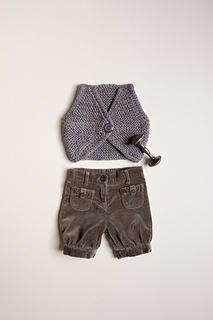 Warm and cozy this is a great bit of outerwear for your little one. YARN: The Fibre Co. Tundra (60% baby alpaca, 30% merino wool + 10% silk: 120 yds/100 gram skein). allium, 1 (1, 2) skeins. GAUGE: 13 sts + 26 rows = 4” (10 cm) in garter st after blocking. 1 - 24” US 9 (5.5 mm) circular. 1 - set US 9 (5.5 mm) DPNs. NOTIONS: Tapestry needle, 2 stitch markers. 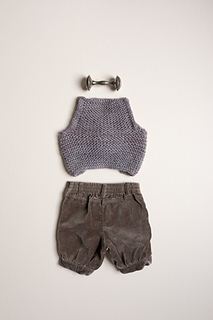 SIZE: To fit: 6 mos (12 mos, 2T). SKILLS: Knitting, purling, increasing, decreasing, attached i-cord. For a tutorial on working our preferred provisional cast on method, visit our tips and tricks here.